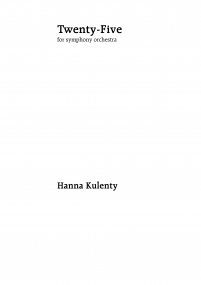 Hanna Kulenty (born on March 18, 1961 in Bia?ystok, Poland) is a Polish composer of contemporary classical music. Since 1992 she lives both in Warsaw (Poland) and in Arnhem (The Netherlands). From 1980 to 1986 she studied composition with W?odzimierz Koto?ski at the Chopin Music Academy in Warsaw. From 1986 to 1988 she studied composition with Louis Andriessen at the Royal Conservatory of Music in The Hague. 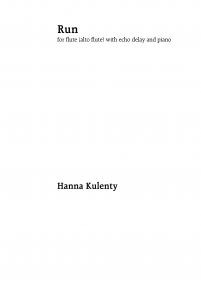 She participated in several summer courses in contemporary music composition in Kazimierz and Darmstadt - where she visited lectures by lannis Xenakis, Witold Lutos?awski, Thomas Kessler and François Bernard Mâche. From 1989 she works as a free lance composer, recipient of numerous commissions and scholar-ships. 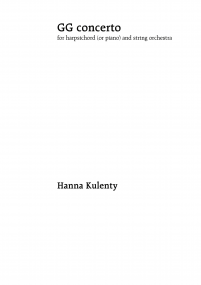 Kulenty has composed 2 opera’s, 12 works for large orchestra and more than 60 other pieces. In 1990 she was guest composer at DAAD in Berlin. In 1999/2000 she was composer-in-residence with Het Gelders Orkest in The Netherlands. She lectured at the Other Minds 10 festival (San Francisco) and at Soundstreams Canada 2005. In that same year she was guest professor at the Conservatory of Zwolle. In 2007 she was guest professor at the ESMuC, Music Academy in Barcelona. She was a jury member during Munich Biennale in 1995, during the International Gaudeamus Music Week 2002, during the International New Chamber Opera Competition “Orpheus-Luciano Berio 2003-2004”, and in 2005 and 2007 during the International Competition of Contemporary Chamber Music in Cracow. 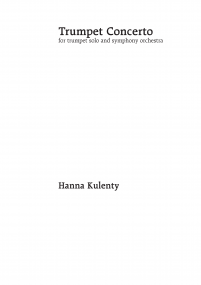 In her early works Kulenty had some sort of emotional structure in mind, an arc design as a way of expressing the intensity curve or energy of a particular structure. She tried to achieve a permanant tension in a sort of European trance music. 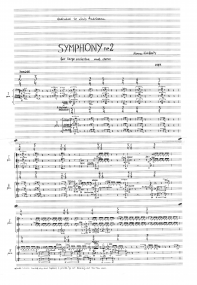 In recent years she calls her compositional technique “polyphony of time dimensions”, emphasizing the circularity of time and the simultaneity of time-events occurring on different temporal planes. Kulenty’s preferred medium is the symphony orchestra, but recently her penchant for musical drama and intensity of emotion found a suitable expression in her music for stage. Since the succes of her opera The Mother of Black-Winged Dreams at the Münchener Biennale 1996 she is considered one of the leading figures on the Polish composers’ scene. 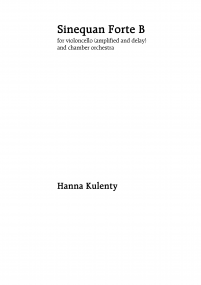 In 1985 Kulenty was awarded the second prize of the European Young Composers’ Competition organized in Amsterdam with Ad Unum for orchestra (1985). In 1987 she was awarded the Stanislaw Wyspianski Award (2nd class). In the same year she was awarded the second prize by the Young Composers’ Competition of the Polish Composers’ Union with Ride for 6 percussionists (1987). 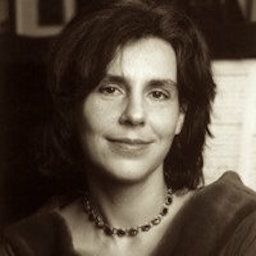 She was also awarded prizes in the Composers’ Competition from the Warsaw branche of the Polish Composers’ Union: Quinto for 2 piano’s (1986), first prize: Breathe for string orchestra (1987), first prize: Cannon for violin and piano (1988) third prize: aaa TRE for viola, cello and double bass (1988) second prize 1989. In 2003 her composition Trumpet Concerto (2002) won the first prize at UNESCO’s 50th International Rostrum of Composers, for which she received the UNESCO Mozart Medal from the International Music Council. 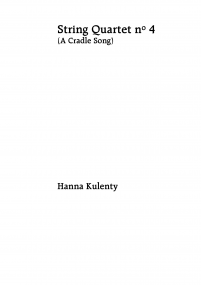 Her compositions Preludium, Postludium and Psalm, for cello and accordion (2007) and String Quartet No. 3 - Tel me about it (2008), were respectively chosen among the ten best Dutch compositions of 2007 and 2008 during the ‘Toonzetters’ contest in Amsterdam. 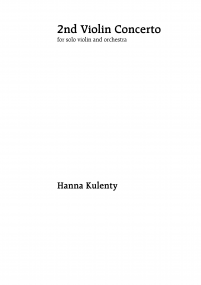 Hanna Kulenty writes for solo instruments, chamber groups, large orchestra’s, opera, television plays and film music. Her compositions have been premiered during festivals throughout the world, like Huddersfield Festival, Schleswig-Holstein Musik Festival, Münchener Biennale, Warsaw Autumn, Musica Polonica Nova and the Netherlands Music Days. 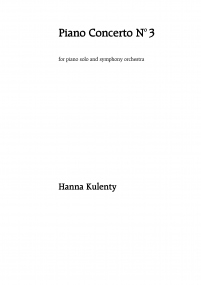 Her numerous orchestral pieces have been performed by symphony orchestra’s in Holland, Denmark, Poland and Germany, with conducters like David Porcelijn, Antoni Wit, Peter Hirsch, Peter Eötvös, Ingo Metzmacher, Renato Rivolta and Ronald Zollman. Soloists like Isabelle van Keulen, El?bieta Chojnacka, Krzystof B?kowski, Marco Blaauw and Frank Peters performed her work, as did the Dutch ensemble ‘de ereprijs’, who commissioned her to write a piece on several occassions. Recently she was commissioned by Kronos Quartet for whom she wrote her 4th and 5th string quartet. 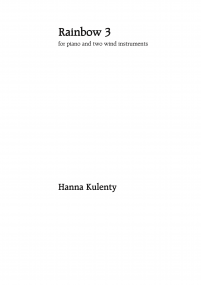 Kulenty’s compositions are published by the dutch publishing house Donemus.